Size: Up to 5 feet or more. Growth Form: Shrub; one erect stem (or leaning), taller than wide, spheric to columnar. Leaves: Leaves modified into spines emerging from areoles; 10 to 32 spines per areole, plants lack glochids; new spines generally red or yellow fading to gray toward maturity; central spines 4 per areole, principal central spine is largest and moderately curved or twisted, hooked spines found only on immature plants. Flower Color: Maroon outside, yellow inside; inner perianth commonly yellow or orange to red; fruit yellow; stigma lobes yellow to red; fruit dehiscent, bright yellow, rarely reddish; deeply hollow except for seeds. Flowering Season: April to May. Elevation: 200 to 4,900 feet. Habitat Preferences: Gravelly, rocky slopes, sandy areas, chaparral (interior chaparral in California), Creosote Bush scrub, Joshua Tree woodland communities; Mojave and Sonoran desert scrub. 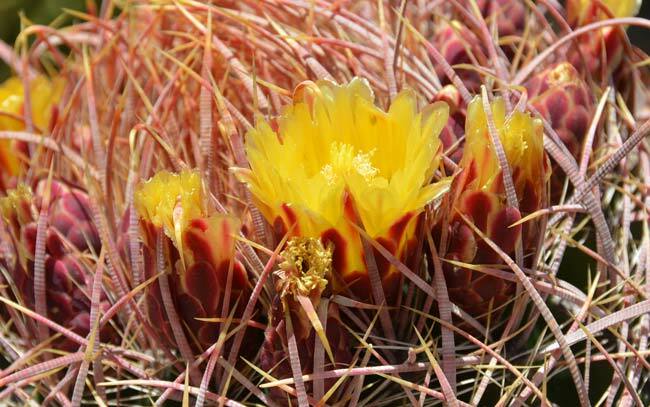 Recorded Range: In the United States Ferocactus cylindraceus is found in southeast California and southwest Arizona. 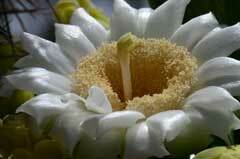 It is also found in Baja California and northern Mexico. North America & US County Distribution Map for Ferocactus cylindraceus. 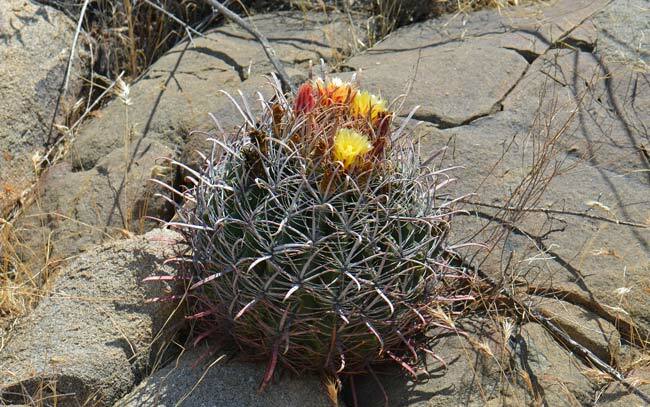 Threatened/Endangered Information: Arizona: Ferocactus cylindraceus is salvage restricted; unofficial: threatened by collecting in California, monitoring needed. Ferocactus cylindraceus var. lecontei, Leconte's Barrel Cactus (AZ, CA, NV, UT). 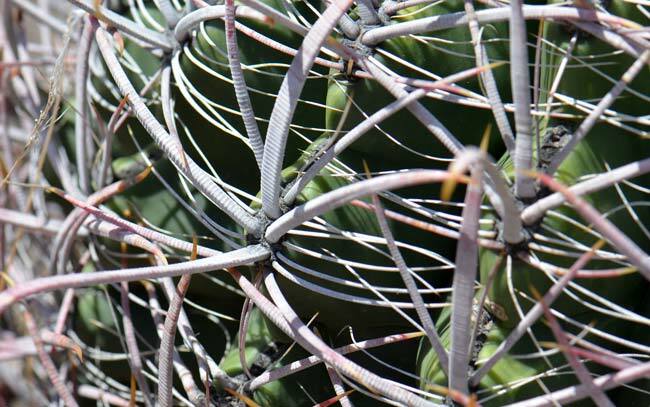 Comments: California Barrel Cactus has incorrectly been called by the common name "compass barrel", however California Barrel Cactus actually grows mostly straight up and does not lean or tilt toward the south. 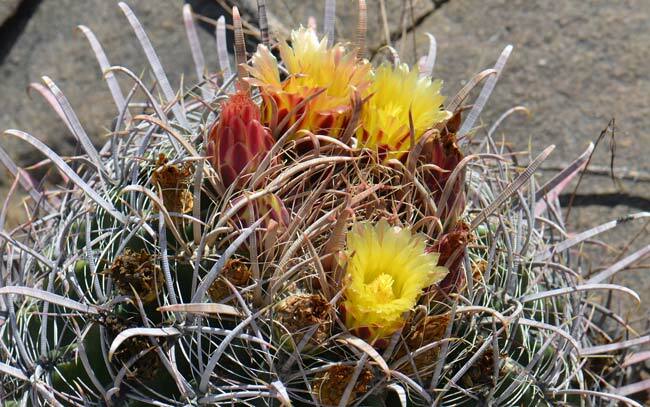 "Compass Barrel" is more appropriately reserved for Candy Barrelcactus Ferocactus wislizeni. Ferocactus cylindraceus was originally described by George Engelmann in 1853. George Engelmann (1809-1884) was a German-American botanist instrumental in describing the flora of the west of North America. Mr. Engelmann was particularly active in the Rocky Mountains and northern Mexico. In Southwest Desert Flora also see Candy Barrelcactus, Ferocactus wislizeni. Ethnobotany Ethno-Herbalist: Southern California Ethnobotany; Ethnobotany of Southern California Native Plants: California Barrel Cactus, Ferocactus cylindraceus. http://ucjeps.berkeley.edu/eflora/eflora_display.php?tid=25765, accessed on July 28, 2017. Allan D. Zimmerman & Bruce D. ParfittFNA FNA | Family List | FNA Vol. 4 | Cactaceae | Ferocactus 3. Ferocactus cylindraceus (Engelmann) Orcutt, Cactography. 1926(1): 5. 1926.; Flora of North America Editorial Committee, eds. 1993+. Flora of North America North of Mexico. 16+ vols. New York and Oxford. SEINet for synonyms, scientific names and recorded geographic locations, (accessed 07/28/2017).